"Give yourself a present for the holidays, and try ClipMate. This is one of my all-time favorites!" Rather than working with one piece of clipboard data at a time, ClipMate enhances the native clipboard functionality by remembering all items (both text and graphic) that are copied to the clipboard and storing them in "collections" for later pasting. With ClipMate as a Windows companion, users will never accidentally lose a piece of clipboard data again. ClipMate's new relational database can hold dozens, hundreds, or even thousands of clips - of all formats including Text, Graphics, and HTML. And with ClipMate's new SQL-based search engine, you'll be able to find your data, and the new Shortcut feature keeps your most-frequently used clips right at your fingertips. 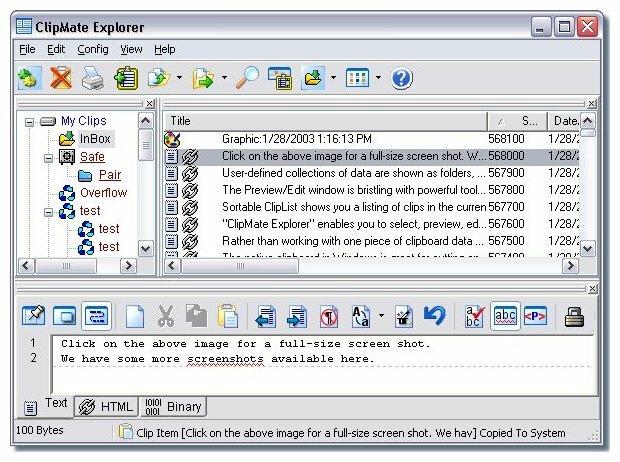 ClipMate Classic presents a toolbar with a drop-down list of clipboard entries. Just pick one and it's back on the clipboard. "ClipMate Explorer" enables you to select, preview, edit, combine, and manage clips. The example below shows ClipMate in "List" mode for reading text. Or you can select "Thumbnails" mode for viewing and selecting images. Click on the above image for a full-size screen shot. See more screenshots of specific features in the "What's New" section. 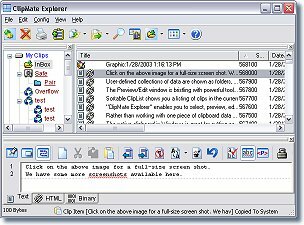 ClipMate will remember the "source url" of any data copied from IE or Netscape, making it easy to revisit the page - with just a click. ClipMate serves as a great screen capture tool, and now has support for exporting captured images as bitmap or jpeg - perfect for sending screenshots by Email. It can also automatically print screen shots, if you wish. ClipMate 6 now features "area screen capture", allowing you to select a portion of the screen. Free electronic delivery, or get it on CD for $9.95 (includes shipping). 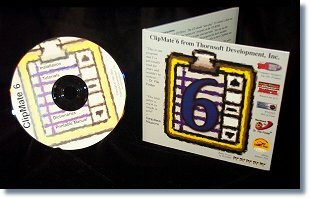 ClipMate 6 runs on Windows 95, 98, ME, NT4, 2000, XP Home, and XP Pro. See the New Features in ClipMate 6 page.